Abigail enjoys stickers quite a bit. 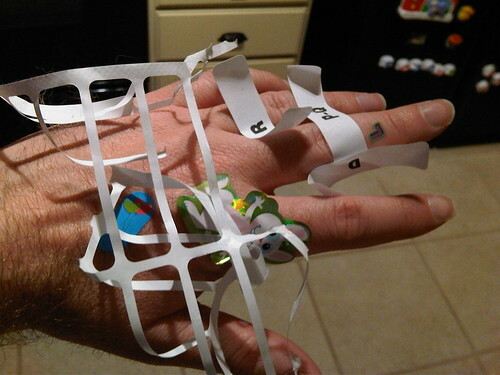 In particular, she enjoys putting stickers on people. 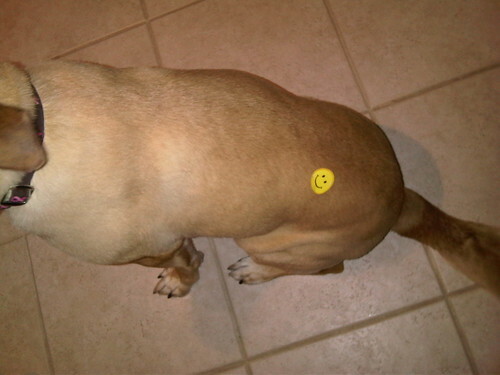 Actually, she would prefer to put most of her stickers on pets, but that often proves to be more trouble than it’s worth. On a recent trip, she particularly wanted to put stickers on Hannah and Janna, the twins from across the street. Since we were in the car at the time, she had to resort to putting stickers on me. Given that she was already slumming it, she had to have some standards – the stickers could only be placed on my t-shirt, not my sweatshirt. I was already well buckled in, so I just leaned over and let her put a few stars and a butterfly on the strip of blue t-shirt that stuck out from the very top of my sweatshirt. This is why I had a conversation with a painting contractor about potential work on the house with a neck full of stars and butterfly. I actually frequently find stickers I was unaware of on my clothes, even after they’ve been washed. It’s possible there’s some random sticker transfer going on, but I think Abigail can be really stealthy about it. When she’s in the zone, her mind fully on her task, she can give the pets a pretty good stickering. On Mother’s Day, my goal was to have her decorate a card with stickers for her waiting mother. Then Henry walked by and Abigail managed to slap a purple heart on his behind (Before there’s any swift-boating, he didn’t earn it). Once she realized Henry was a potential sticker target, the card was essentially finished. Maggie is an easier target, and often wanders the house with a star or smiley face emblazoned somewhere on her fur. Actually, tail taping has been a popular move of late. Basically anything that can be stuck can end up on Maggie. It’s a pretty serious dogupational hazard. This entry was posted in Abigailia and tagged Dogupational, Stickers. Bookmark the permalink.